Lately I have been a bit discouraged with our school culture and the lack of investment and ownership our students show in ASIS. While stewing on the matter and brainstorming what I could do about it, I decided to tie my next unit on perspective into the idea of school investment. I was hoping to spark a little thought on the subject AND fit the writing across the curriculum requirement into a lesson that still worked on what we needed to accomplish in regards to art standards. Whew. After some internet searching and brain racking, I settled upon taking a time-out from TAB for this stretch between Thanksgiving and Christmas, and doing a 3 part lesson with all grades. 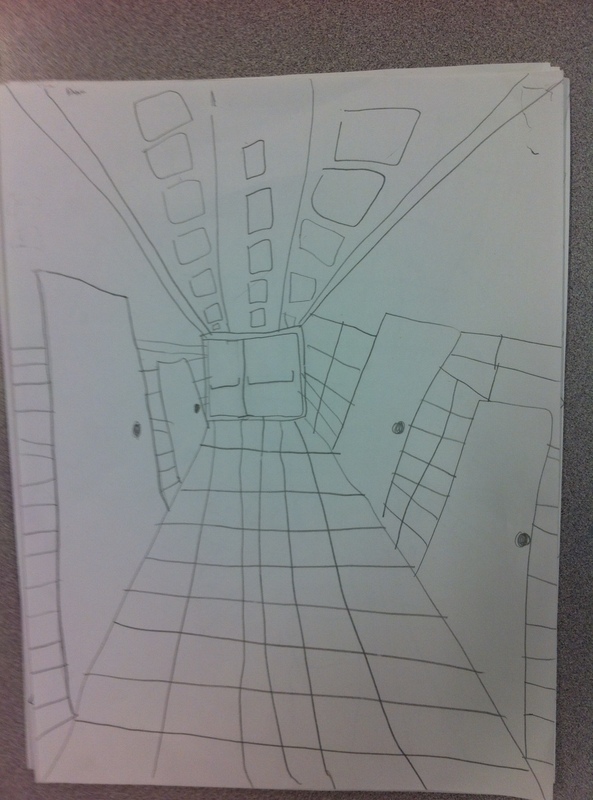 Part 1: Presenting a lesson on one-point perspective (my 5th and 6th graders needed review on this anyway since it is one of the areas we struggled with in the diagnostic). I am using a Prezi I had stumbled upon last year and tweaked – find the link here – that highlights one-point perspective and vanishing points. It helps students understand this idea of perspective vs reality and gets them comfortable with the way things look as they go off into the distance (meeting at the vanishing point, things getting smaller, etc.) I have students find the vanishing point and discuss the characteristics of many photos/drawings that demonstrate one-point perspective. Once they seem pretty comfortable, I am giving them clip boards, paper, and a pencil and we are heading into the hallway to draw the school as it is. 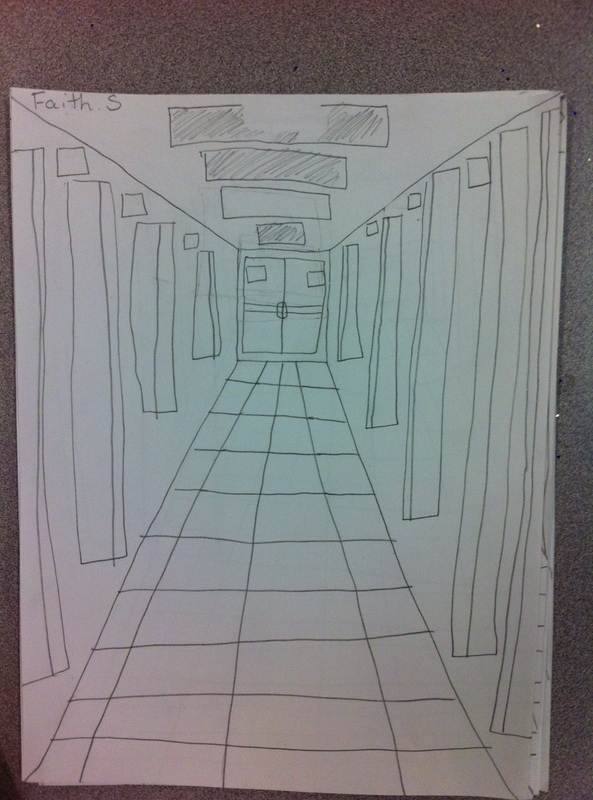 I am having students look down the hallway and notice what happens as things get further away, highlighting size and the vanishing point idea in real life. I am then demonstrating how to get started and leaving them to work. I have found that behavior tends to be better in this situation because it is something new and exciting as well as an accomplish-able task. 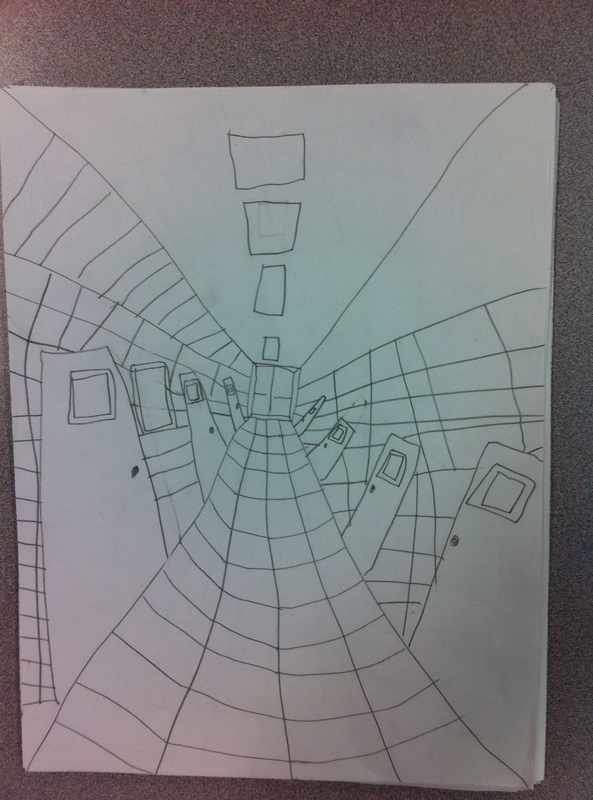 See a few third and fifth grade examples from the start of our drawings below – they didn’t quite finish in the 15 minutes but they have a pretty solid start. Part 2: Part 2 is where I focus on writing and tying in the investment piece. In this lesson, students will be (this is happening next week) given a survey and graphic organizer that asks about our school now and their dream school. I have them reflect on the positives and negatives of school as it is. We will then discuss what a school is for, what should happen there, and what needs to be in place for it to be considered a school. Students will have a writing prompt to explain what their ideal school environment would consist of. They will be expected to highlight classes that are offered, what students and teachers are doing, what the halls look like, lunch menus etc. in order to paint a vivid image of their dream school. Copies of the survey, graphic organizer and writing prompt can be found below. Part 3: In the final 2 lessons, students will go back to the idea of one point perspective, but this time, will be choosing symbols to represent what they conceptualized as their dream school. I will do a mini-lesson on symbols and we will brainstorm some ideas together to get them started; then it is back in the students hands. 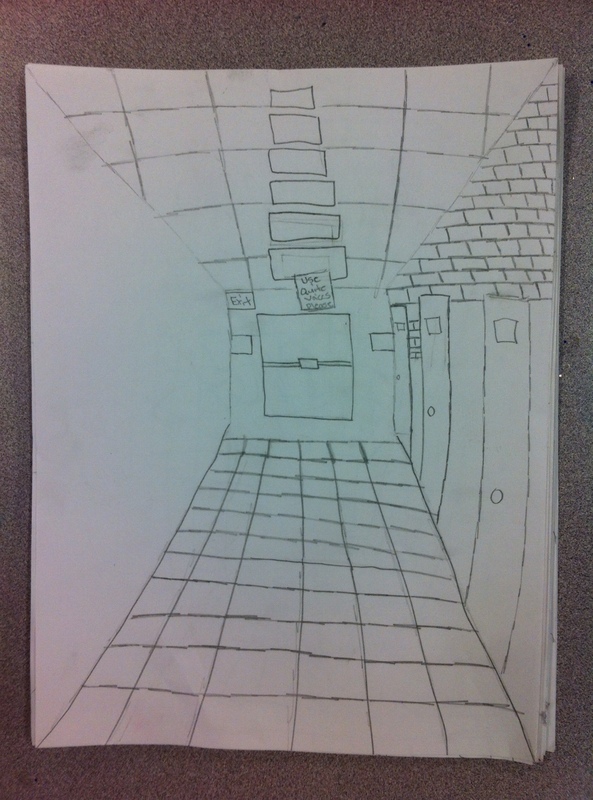 They will set up a general perspective hallway drawing and then add the things that make it THEIR school. At the end of day one, I will have students do a group share at their tables in order to get feedback as to whether or not their symbols are coming across clearly. I am not quite sure what format I want this to be in yet, but I am thinking just a simple discussion with guiding questions may do. Day 2 of Part 3, will be finalizing, adding color, and displaying. I am going to have students mount the picture of their school next to their writing prompt on black paper which we will hang in the hallway after break! I am excited to see what kids’ perspectives are on a dream school and hope that it sparks interest and discussion of what we need to work toward in order to make their dreams come true. Many of our students do not realize that they have the power and ability to be a catalyst for change. I am hoping this project gets at least some of them thinking in that direction. I know planning it and starting in the early stages has rejuvenated some of my excitement about what I and students can be doing to be a part of a positive environment. This is the project my 4th graders are working on at this very moment. In this lesson we discuss weaving, Kente cloth, radial balance, patterns and colors as symbols. Not a bad spread for a project that also keeps their attention. Kids love weaving. This is my second year doing the project and both years my students have been reluctant at first but once they get into it…collaboration, focused work, creativity, pretty much everything good is just spilling out of their little fingers. Amazing. Have I mentioned I lovvvve my weaving unit? I usually read the book The Spider Weaver. I also have a PPT on patterns, fiber arts and Kente cloth to accompany as an introduction to this lesson. Year 1 I had the kids string up their paper plate looms. I had precut the plates with slits but it still took an entire lesson to get them all to have looms ready to weave. Year 2 I decided I thought the process was more important and wanted to save that extra day for something else so I gave them pre-strug looms. It then comes down to demonstrating how to weave and change colors. I normally demo, then do a little chant about under, skip one, under skip one, etc. I let the kids go and stop at each table demonstrating individually. By this time usually at least one kid from each table has picked it up and can help out the kids around them. Yay peer teaching! I give the kids 2 more class periods to finish. Of course we always have early finishers so I just have an alternate project prepared for day 2. When everyone is done, we tuck in the ends and tie them off!